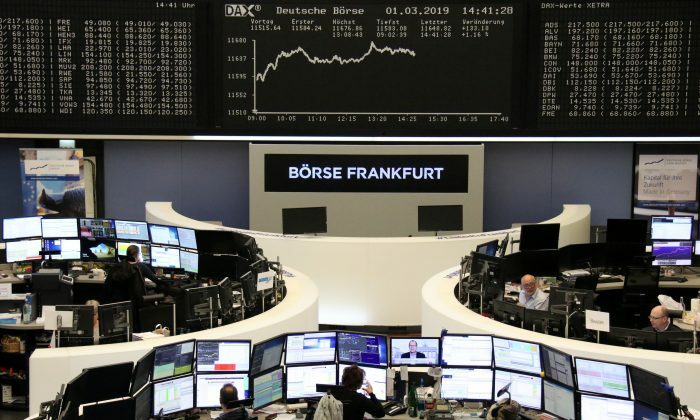 European shares were on course for a fifth day of gains on March 19, powered by a strong rally in automakers after Peugeot suggested Fiat Chrysler was among the options for a merger, and as Bank of America Merrill Lynch talked up stocks in the sector. “There is likely to be some short covering today given that sentiment across the world is positive in stocks and some traders have been viewing the poor economic indicators of the eurozone as justification for shorting the eurozone,” said CMC Markets analyst David Madden. Madden said the Fed was likely to maintain its data-driven policy approach. This would follow moves by the European Central Bank two weeks ago to reloosen policy and pump more money into the financial system, offering hope of a continuation of stock market gains. Daimler, Volkswagen, and Porsche were among BAML’s top picks, helping German stocks stage a rebound from Monday’s fall to a five-month high and lead gains in the region. The speaker of parliament on March 18 ruled May could not put her deal to a new vote unless it was re-submitted in a fundamentally different form. May is due at an EU summit in Brussels on March 21 at which she will ask for a delay to Britain’s planned departure from the bloc on March 29. Online supermarket Ocado climbed to a record high after posting strong gains in first-quarter retail sales despite a fire at its flagship distribution center. French telecoms operator Iliad dropped almost 3 percent after the company cut its cash flow target for 2020 in France and added it was considering the sale of part of its mobile assets. Investors in the U.S. seemed to turn more optimistic earlier in the day, but then resumed their selling. A 1 percent change in stock prices hardly does this controversial week justice.